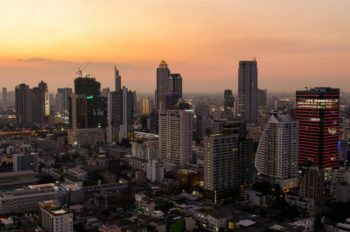 This post is for those who love Bangkok as much as we do, for those who haven’t had the chance to visit yet but want to get infected by the Bangkok bug, and for all those who aren’t as crazy about Bangkok (yet). The city is much too big for us to explore everything on our own, so we asked five awesome fellow travel bloggers for their very personal secret spots in Bangkok. Suffocating heat, thousands of different smells, a hectic hustle and bustle of people, colorful meat skewers at street stalls – that’s what makes Bangkok what it is and that’s why we love this city. Not everyone takes to this colorful, hectic but beautiful city quite so readily. Either you love it or you hate it, there isn’t much in between. We can’t get enough of this Southeast Asian hotbed and always look forward to our umpteenth visit to Bangkok. 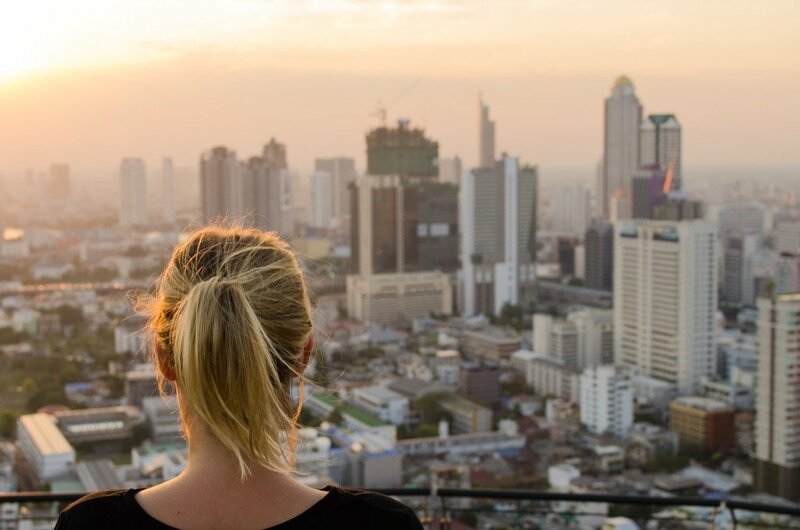 Alongside three of our own tips, this post contains unadulterated Bangkok love and another five exciting places where you’re sure to avoid the tourist crowds. We hope you have a great time discovering Bangkok. 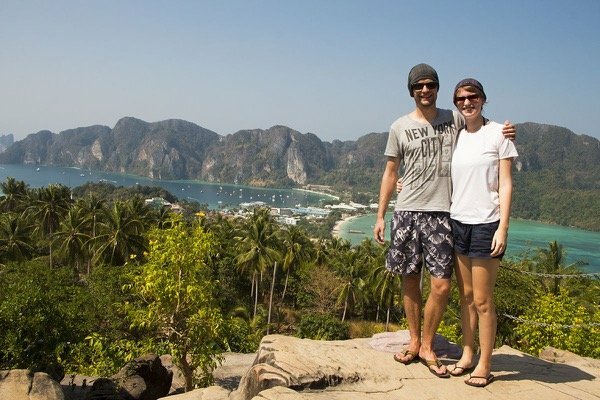 Our first Bangkok secret spot comes from Tobi and Marcel from Home is where your Bag is. 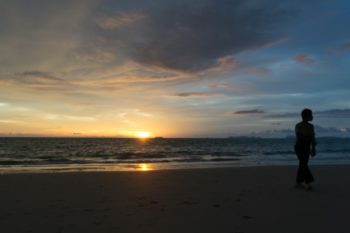 Their blog is full of useful information on destinations in Asia and Australia/Oceania. The two of them know Southeast Asia like the back of their hand. No wonder, considering they spend most of the year with their girlfriends in Thailand. Our secret spot for Bangkok is Koh Kret: an island in the middle of the Chao Phraya River that flows through the capital of Thailand. An oasis to escape the big city jungle and the breakneck pace of Bangkok so to speak. The island is particularly popular with the locals for weekend outings and you rarely encounter any tourists there. Koh Kret is really small and only it takes about 2-3 hours to walk once around it. If that sounds too exhausting for you, then you can just hire a bike when you get there. There are times when the paths are flooded, but you shouldn’t let that keep you from going. Koh Kret is especially famous for its pottery art that you’ll see wherever you go on the island. But it’s also home to some impressive temples such as Wat Sao Tong Thong. A very cool destination for a half-day or full-day trip just to the north of Bangkok. There are two different ways to get to the small island. Both are very cheap and take about just as long. 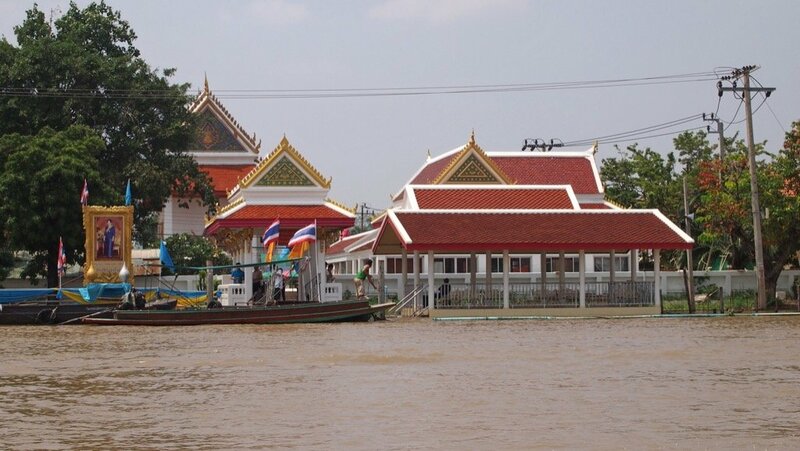 # 1 By Chao Phraya express boat, either from Sathorn Pier (BTS Saphan Taksin) or Tha Chang Pier by the Royal Palace. The boats run daily (except on Sundays) every 15-20 minutes and you have to get off at Pak Kret Pier. Depending on where you leave from, the trip costs between 15 and 25 baht. Afterwards you have to take a small ferry near the pier for 5 baht that goes directly to Koh Kret. On Sunday, there’s also a boat going there from Sathorn Pier at 9 am, which offers a guided tour for 300 baht, including lunch. # 2 You can also take a bus to Pak Kret market. To get there, take the number 166 bus from Victory Monument or number 505 from the Central World shopping mall. The trip takes about 30 minutes and costs around 20 baht. When you arrive at the market, you’ll have to walk a few hundred meters to the ferry pier to transfer to Koh Kret for 5 baht. 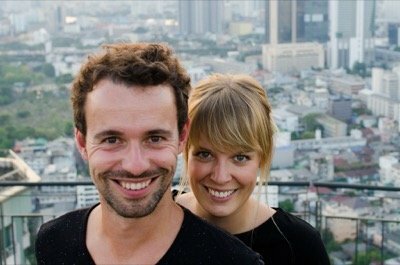 The next Bangkok secret spot comes from Sabrina and Francis from my-road.de. The two did everything right and have been on a trip around the world for over a year now. How long will it last? As long as they want it to. A wonderful plan, we think! Muay Thai is Thailand’s national sport with a long and proud tradition. 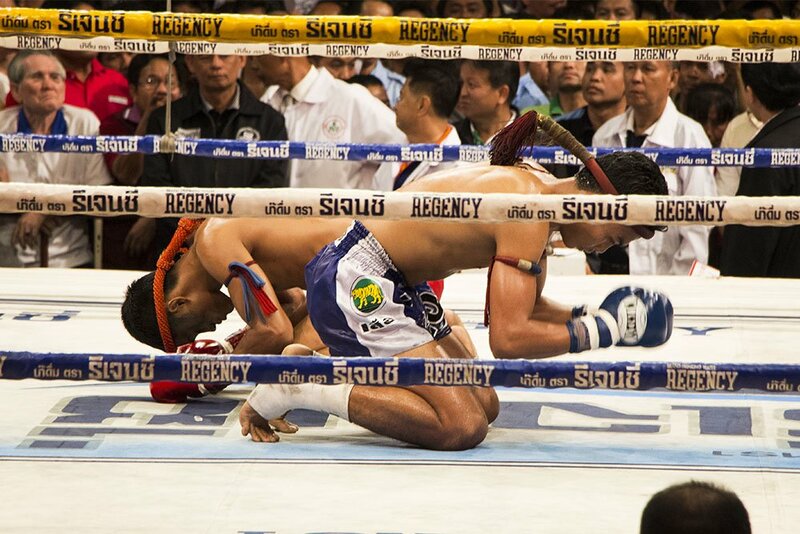 Fighters also use their elbows and knees, making Thai boxing one of the most dangerous martial arts in the world. You can experience the thrill of the fight for yourself at one of the many boxing matches around the country. Bangkok is the perfect starting point to discover this exciting sport because the capital is home to the country’s most famous stadiums. And you can even visit one of the best arenas for free. Every Sunday, the TV station Channel 7 broadcasts fights throughout the country and waives the admission fee to make sure the stands are full. 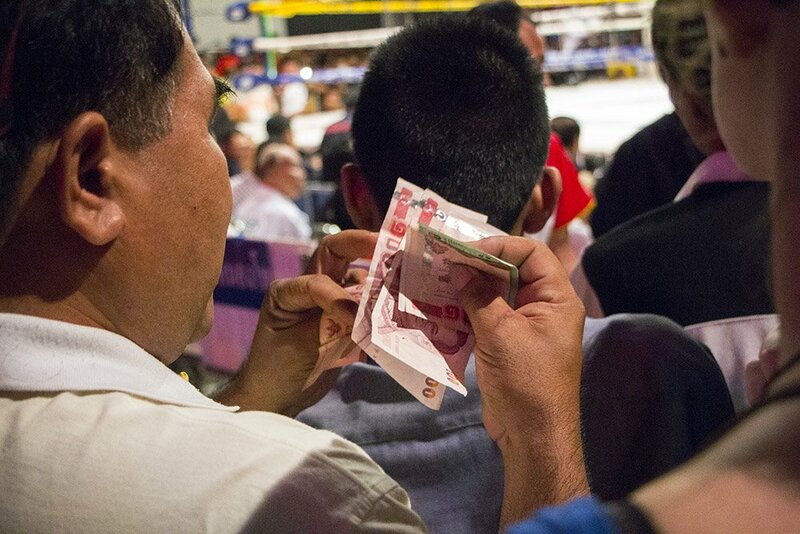 The quality of the fights is top-tier and you get to experience the Thais’ enthusiasm for this sport first-hand. To enjoy the fights, you should get there at around 12:15 pm. There’s a grandstand specially for tourists opposite the entrance where you can sit. But if you arrive late, you’ll have to push your way through the crowd. We were pretty late and only managed to make our way through to the stands after several fights. That didn’t really bother us though, because that way we were in the middle of the action to see the Thais cheering the fighters on and betting with each other in between the rounds. If you don’t mind being cooped up with crowds of people, then that’s an amazing experience in and of itself. The action-packed spectacle at Channel 7 lasts for over two hours. The ropes at the ringside make it hard to take good photos from the lower stands. The tourist grandstand offers a much better vantage point for photographers. If you want to make sure to get a seat there, try to get to the arena before noon. To get to Channel 7, take the MRT to Chatuchak Park or the Skytrain to Mo Chit. The follow the main road northwards and take the first right. Follow that road (Soi Phahon Yothin) until you see the TV building on the left-hand side. There will be crowds of people flocking to the arena, so you can’t miss it! It’s about a 15-minute walk from the BTS or MRT station. Or course you can also take a taxi. The next tip comes from Mandy from Go Girl! Run!. 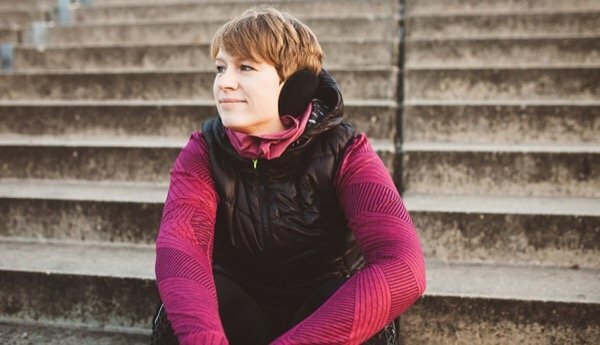 Her blog is all about her two favorite pastimes: running and traveling. The perfect place if you need some motivation to get active yourself. As a runner, my tip should come as no surprise: Going for an early morning run in Lumphini Park! 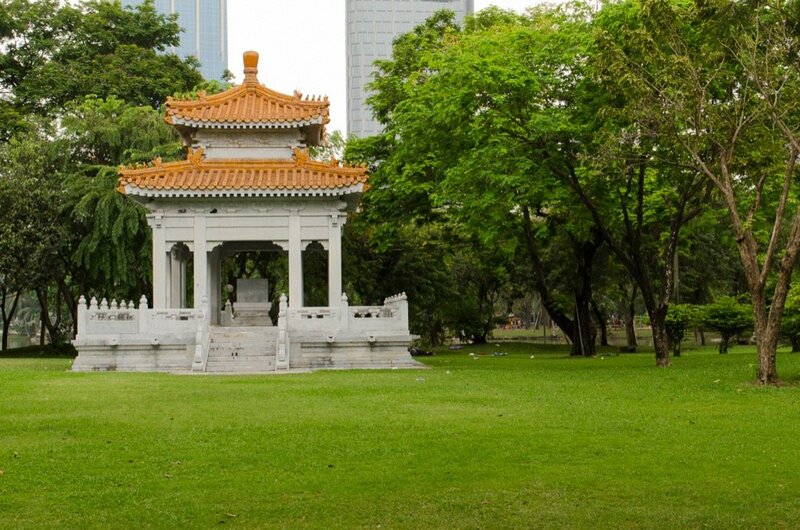 This small oasis of peace and tranquility is located right in the heart of Bangkok. Especially for runners and outdoor athletes, the park offers plenty of space for workouts and some great running trails. 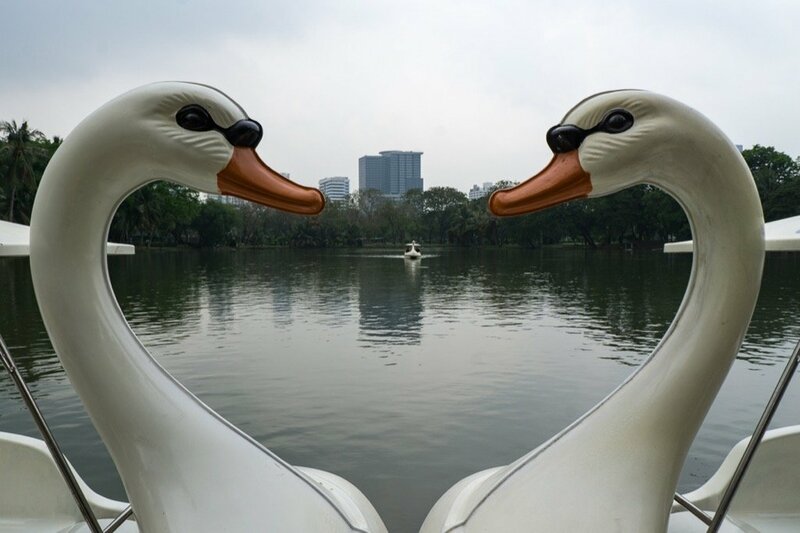 A 2.5 kilometer-long fitness trail takes you straight through the beautiful green park with its lakes that reflect the surrounding skyscrapers. It’s absolutely idyllic here in the morning. The only catch: You should really try to be there at the crack of dawn to avoid the oppressive Bangkok heat. But I can promise you one thing: You won’t be alone! From tai chi artists to yoginis and other runners, they’ll all be there sharing the park with you. 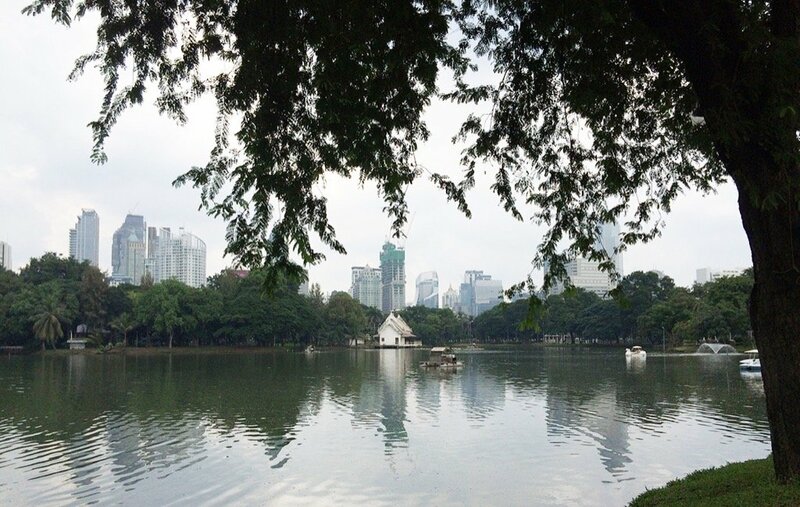 If you’re staying in the Pathum Wan district, you can run directly to the park. Otherwise, you can also take the MRT to Silom or Lumphini or the BTS to Sala Daeng to get there. This secret spot comes from Florian from the backpacking blog flocblog. 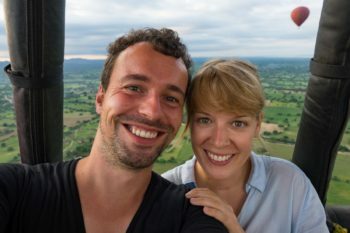 In June 2011, Florian started on a 1-year trip around the world. He must have really enjoyed the year because he’s still on the road today. But one thing has changed: In 2012, his girlfriend Michela, whom he met while traveling through Chile, joined him on his journey. Sounds like a good plan, right? 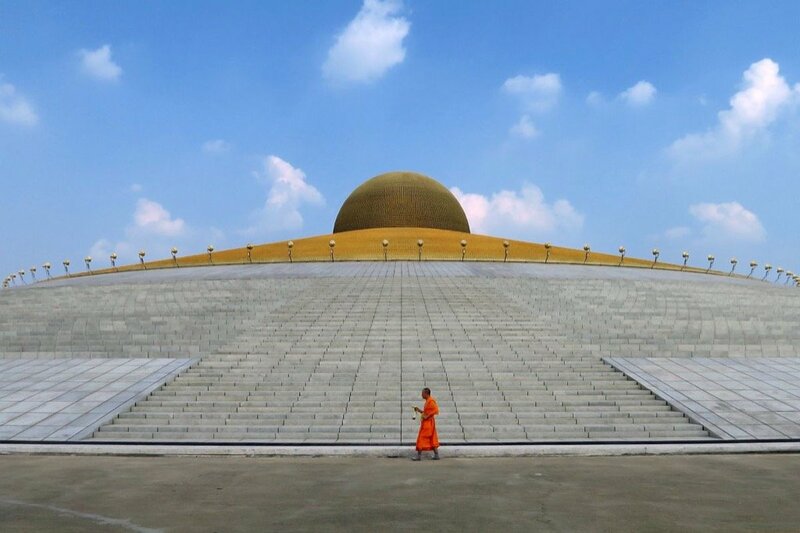 You’ve probably never even heard of the world’s largest temple. Perhaps you’ve already seen it though, e.g. during the landing approach to Don Muang Airport in Bangkok. The huge symmetrical temple complex of Wat Phra Dhammakaya is hard to miss from the air. You can also see the large dome in the distance when driving on the highway. The Buddhist temple is often compared to a UFO and has nothing in common with the architecture of a typical Thai temple. Photographers are sure to be fascinated by the symmetry and the enormous dimensions. 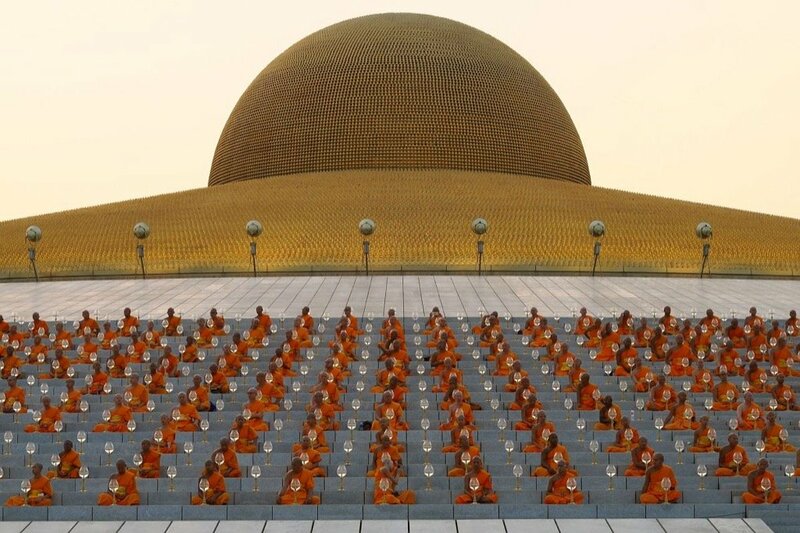 But the simplicity is deceptive: The UFO’s golden dome of consists of 300,000 small Buddha statues. The temple is operated by the same Buddhist sect that organizes the mass flying of sky lanterns at the Yee Peng Festival in Chiang Mai. The sect has a bad reputation in Thailand due to corruption allegations. But that’s actually a good thing for you because they’re especially eager to make up for it by making visitors feel extra-welcome and offering free guided tours. If you’re there in February, then be sure to visit on Magha Puja Day. 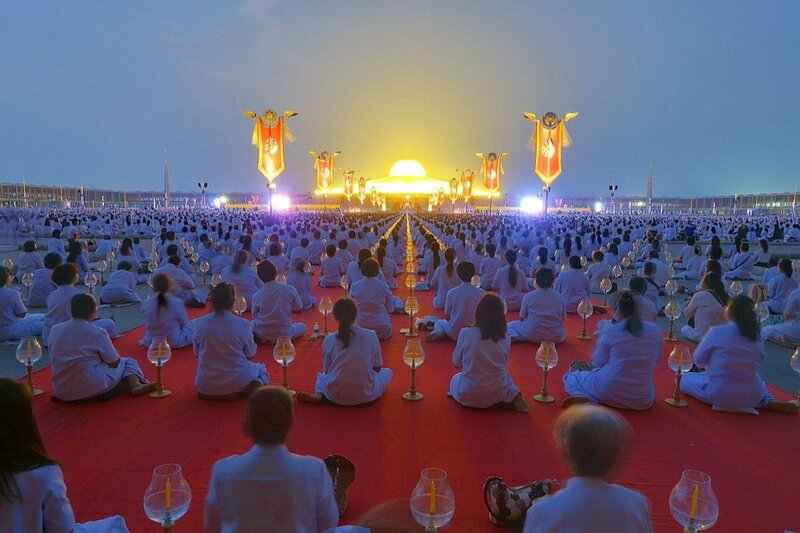 It’s a major Buddhist holiday where over 100,000 people flock to Wat Phra Dhammakaya for a huge mass meditation. The number 29, 34, 39, 59, 95, 185, 503, 504, 510, 522, and 538 buses all go to the Future Park Rangsit from Chatuchak. From there you can take a taxi to ‘Wat Thammakay’ behind the Thammasat University Rangsit for about 100 baht. The whole trip takes about 1 1/2 hours from Chatuchak. This secret spot comes from Sebastian from Off the Path. 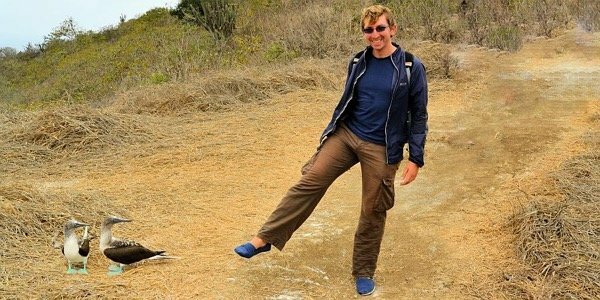 Sebastian has made his passion, namely traveling, a profession and takes you with him to the most beautiful places in the world on his blog. But don’t worry, his journey is far from over. 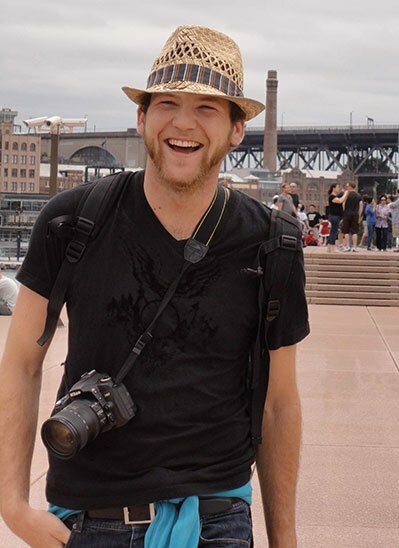 He’s already lived in 10 countries as a digital nomad, has traveled to more than 100, and as if that weren’t enough, he also speaks five languages ​​fluently. Sounds like an adventure, right? I lived in Bangkok for a year and since then I’ve returned to this crazy city several times per year. As a travel blogger and digital nomad, it’s one of my many homes in this world and I know my way around really well. I lived in the Huai Khwang district and the Huai Khwang Night Market is just around the corner from there. 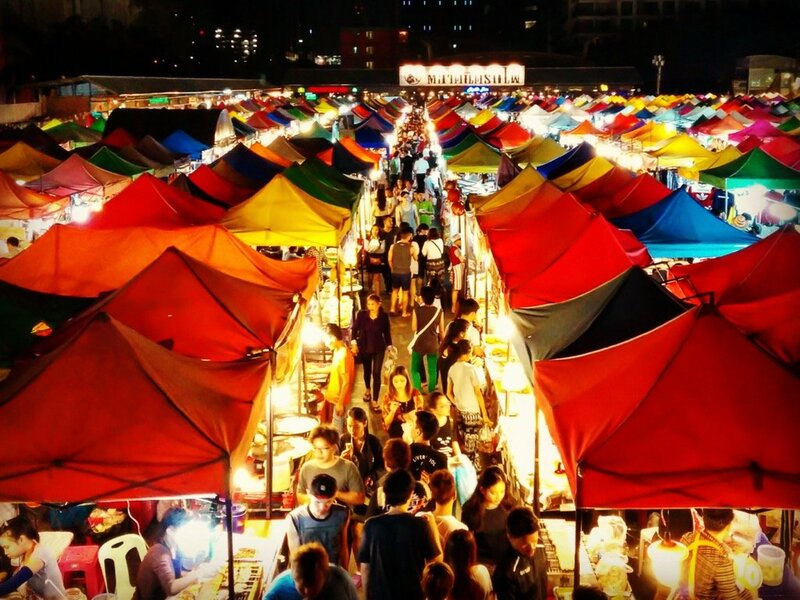 Unlike other night markets, you’ll really only meet locals and expats here, making this market a real well-kept secret! There are stalls with clothes, DVDs, or various electronics, and of course heaps of jewelery and cosmetics for the girls. But of course you can also find super-delicious food and two of my favorite Thai snacks: Cha Yen – iced sweetened tea – and sweet sticky rice with mango and coconut milk. Yummy! Every time I visit Bangkok, I always make sure to visit Huai Khwang Night Market. Because my second secret spot is here too: my absolute favorite restaurant in Bangkok! Only Thais come here to eat and the dishes are simply super-delicious! The restaurant is actually one of the more expensive by Thai standards and you’ll pay about 4 euros per dish. But it’s still always packed here! 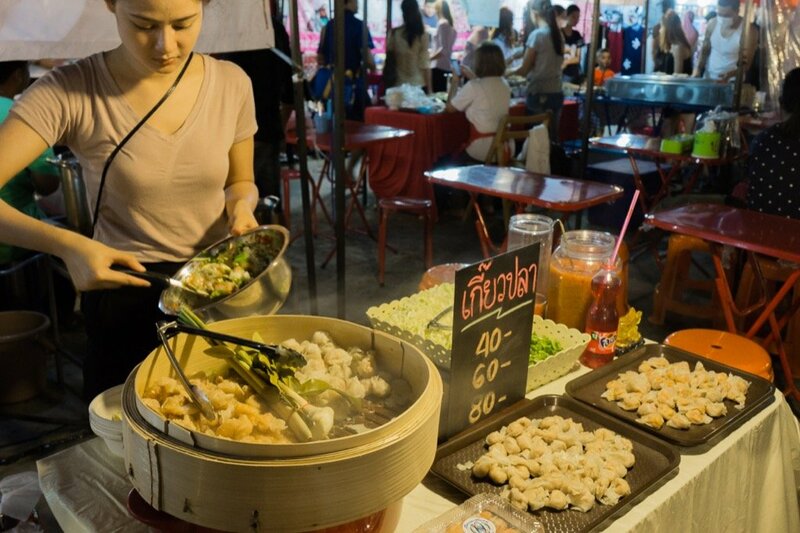 The easiest way to get to Huai Khwang Night Market is by taking the MRT – just get off at Huai Khwang and head down Pracha Songkhro Road. The restaurant is on the left-hand side of the road if you’re coming from the MRT station and has a sign with blue Thai letters. Here’s the exact location on Google Maps. Now that five great bloggers have revealed their secret spots in Bangkok, we want to share our own tips. Here are three more tips for your trip to Bangkok. 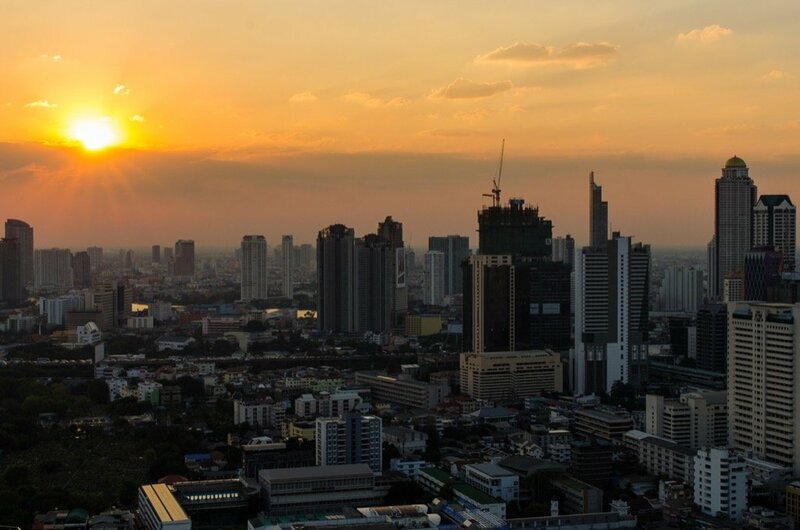 There are so many rooftop bars in Bangkok that it’s hard to pick a favorite. Most of them have a relatively strict dress code and are relatively expensive, so a cocktail often costs as much as a room at the hotel. Since we only travel with hand luggage, we usually don’t even have the right outfit for a bar with a strict dress code. Enjoying the sunset over Bangkok at a rooftop bar while sipping an unaffordable cocktail for hours was out of the question for us too. So we went looking for a rooftop bar that not only affords you a great view of Bangkok’s skyline but where the drinks are affordable, a casual dress code is sufficient, and you don’t have to book a table in advance. Not that easy, but we found what we were looking for and would like to share this tip with you. The bar we’re talking about is on top of the Anantara Hotel in Sathorn. The hotel is located to the south of the city center, so it gives you a great view of the skyline and you can watch the sun setting behind the buildings. We got there at around 6 pm and still managed to get a sofa with a perfect view, and the happy hour at the Zoom Bar goes until 8 pm, so you can get two cocktails or beers for around 5 euros. That’s a pretty fair offer for a nightcap on a rooftop bar in Bangkok at sunset. Apparently the policy has changed now though, so the happy hour is only valid for the terrace one floor further down. But we hear it’s really nice there too. Of course, you could also stay directly at the Anantara Hotel in Sathorn. Then you can enjoy the view from the roof whenever you want, or even get a room with a view of the skyline. 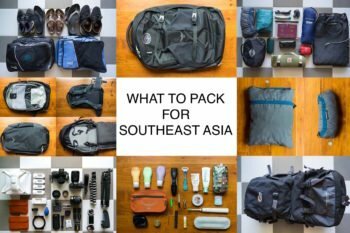 We show you our very own list of what to pack for Southeast Asia. Curious? The bar is perfect for photos of the city as you can take great pictures on the top floor without a tripod. 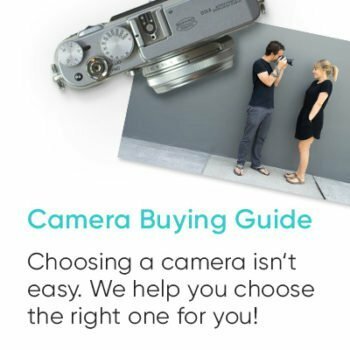 There’s a wide handrail and bar counter there where you’re welcome to set up your camera. 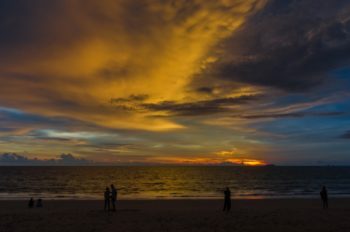 Depending on your lens’s light level, you may be able to take pictures of the sunset while holding your camera. As the evening gets on, we recommend setting the camera down and taking pictures with a remote release or a timer. There are several ways to get to the hotel. Of course the easiest way is to just take a taxi. But keep in mind that the roads in Bangkok are often congested, so it might take longer than public transport, especially during rush hour. Alternatively, take the BTS to Chong Nonsi and then take a taxi the rest of the way, or just walk south for about 10-15 minutes. This may sound a bit weird and to be honest, it is. 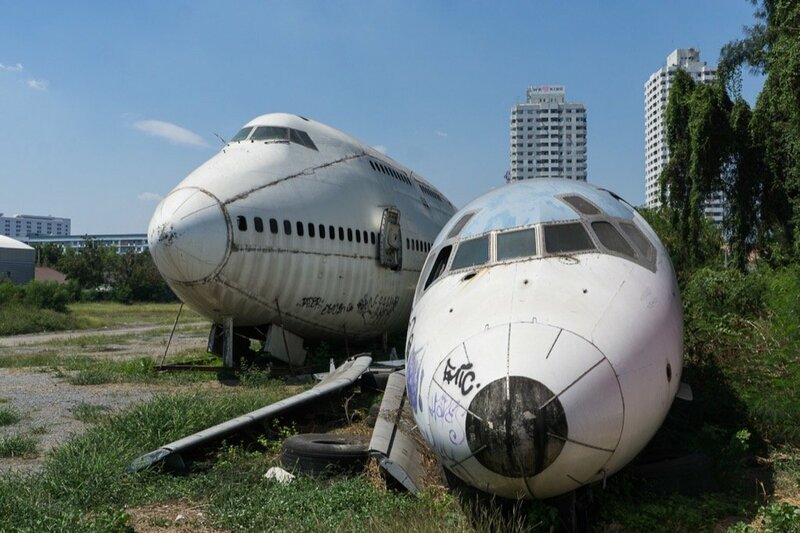 There are several aircraft wrecks in the middle of Bangkok, right next to a busy thoroughfare. They’re only separated from the road by a little fence. 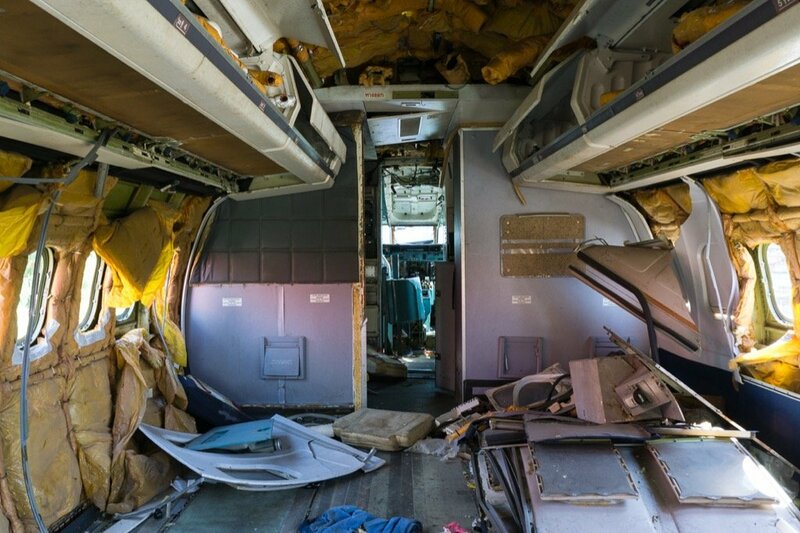 And as if that wasn’t absurd enough, it gets even weirder – parts of the airplane wreckage provide housing for several families. They make a living off of their curious tourist attraction by charging visitors around 5 euros to visit the site, and we’ve heard that they’re happy to show you their homes for an additional 5 euros. But we only checked out the uninhabited wrecks. The best way to get there is by ferry. Take the ferry near the MRT station Phetchaburi, for example, and stay on for 14 stops until you get to Wat Si Bunruang. Each stop also indicates the name of the next one so you know when to get off. When you arrive at Wat Si Bunruang, walk towards the bridge, then go back down the stairs on the other side of the bridge, and walk a few meters back the way you came down the canal. 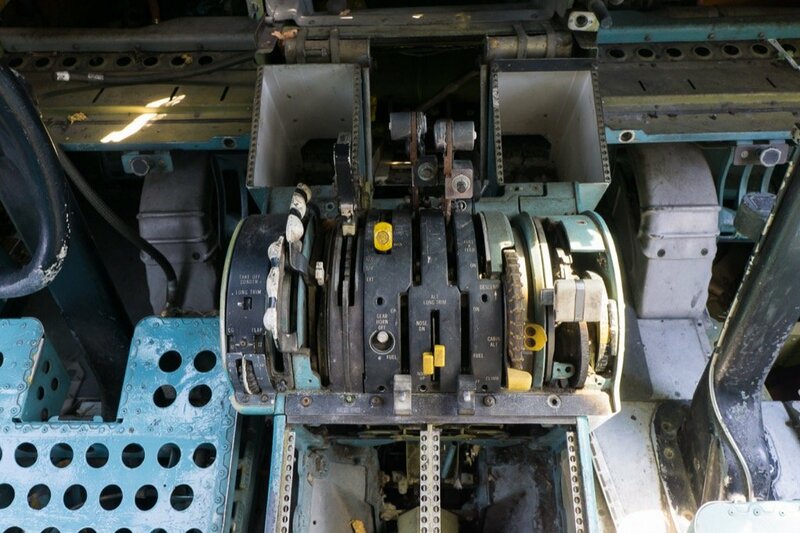 The planes will be on your left-hand side. You can see the location on Google Maps here. If you switch the view to satellite or Earth, you can also see the planes. Wherever you go in Bangkok, there’s generally a market behind waiting for you behind every street corner. But Rod Fai Market is really something special. We liked it there so much that we’ve been back several times since our first visit. The market offers a good mix of food, clothes, and nightlife. If you’re looking for authentic Thai food, you’re in luck. The dishes here are prepared with locals in mind so you brace yourself for a true taste explosion. Besides the normal stalls, there are also bars where you can see the day off with an ice-cold beer. But a ‘bar’ here is something special too, because they’re all located in old shipping containers, placed next to and on top of each other. This market is a lot of fun. Just give it a go! 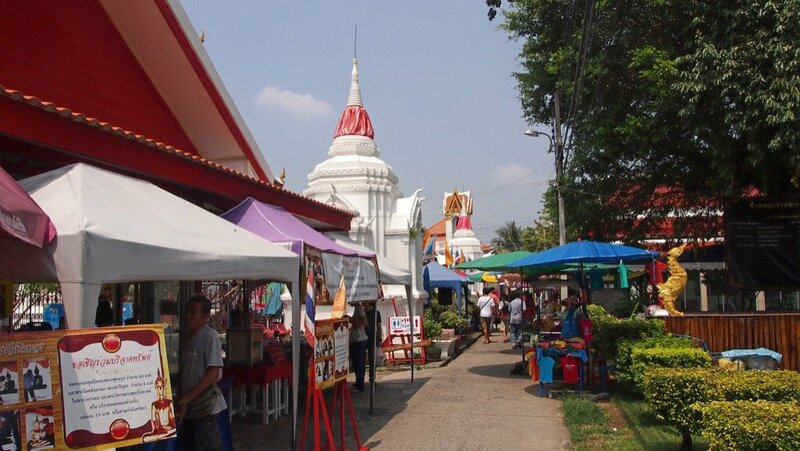 Rod Fai Market opens from 5 pm to midnight from Thursday to Sunday. Take the metro (MRT) to National Cultural Center and leave the station at Exit 3. The market is located behind the Esplanade Shopping Center – just follow the crowds! Hotel tips: Sribumpen Plus – Great value for money, recently opened, and great location. U Sukhumvit – Design hotel, great location, great value for money, including pool on the roof. You can find even more tips in our post on where to stay in Bangkok. 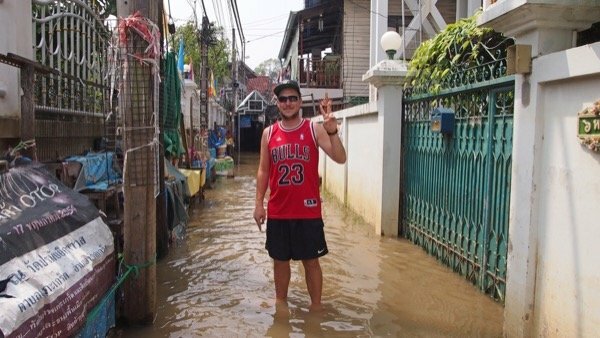 Guided tour tips: It’s your first time in Bangkok and you want to visit the typical sights? Go on a guided tour and get to know the city with an insider! 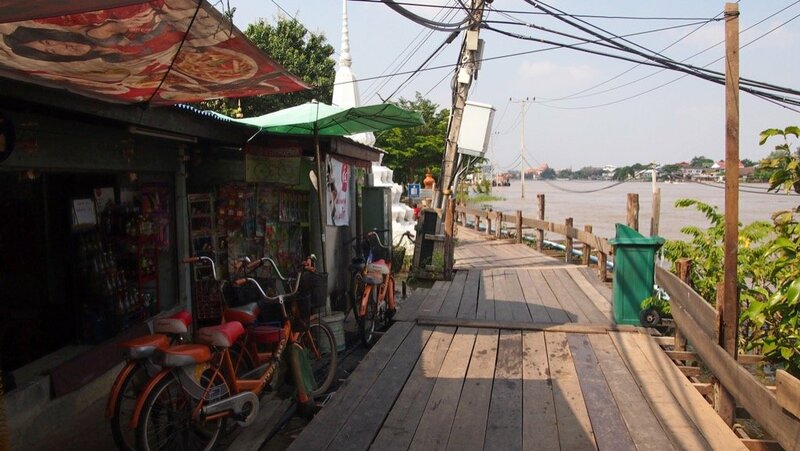 We enjoyed these two tours very much: 1) Private city tour – one day in Bangkok and 2) Bangkok – bicycle tour at sunset. 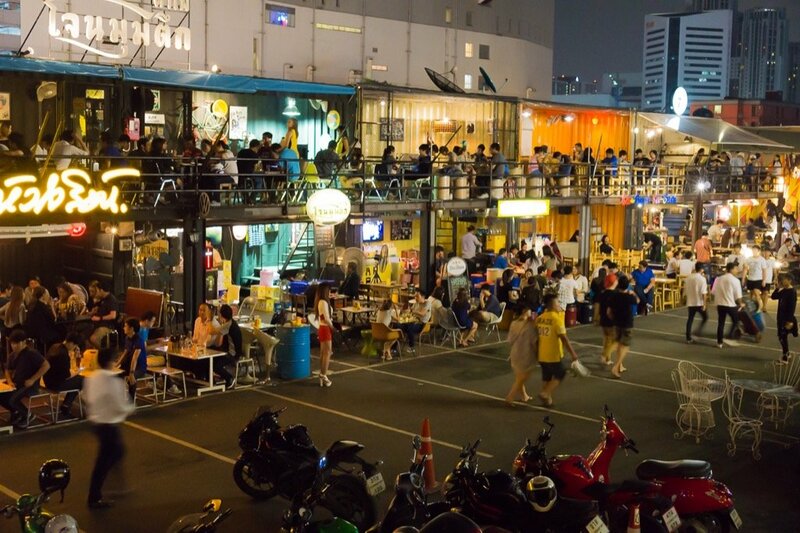 Do you know any secret spots in Bangkok? 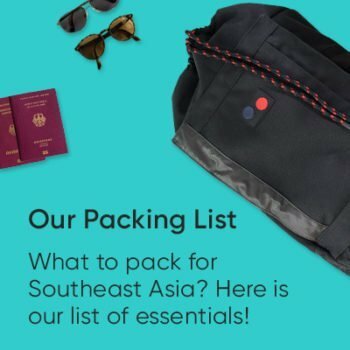 Do you have some great travel tips of your own for Bangkok or any questions you’ve always wanted to ask? What do you think of the tips in this post? Have you been to one of the places?